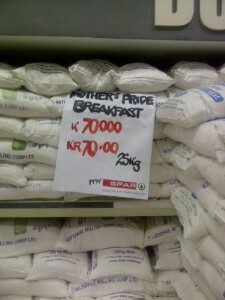 The retail price of mealie-meal has been increased by more that Kr5 (K5000) due to the removal of fuel and maize subsidies. But ailing dictator Micheal Sata yesterday continued telling hungry people as he campaigned in Mkushi that his regime did the right thing to remove the subsidies which were aimed at keeping prices affordable. Sata, who eats when and as he feels because he has food in abundance, told villagers in Mkushi that the subsidies were only benefiting the rich people. He did not explain if the rich people are now unable to buy mealli meal. Prices for a 25kilogram bag have gone up by K2 and up to K6 for wholesale and retail respectively effective July 8, a survey has revealed. Millers Association of Zambia president Allan Sakala said the increase has been necessitated by the removal of subsidies on fuel and maize. Some milling companies have increased the price due to individual costs that firms incur during production on account of now expensive fuel.